With the annual school holidays looming, many parents, grandparents and carers the world over will be anticipating the children breaking up from school and the added busyness that that brings. Are you looking to the holidays with eagerness or bracing yourself for a stressful time? Some stresses can be avoided. Many people plan their finances so that the stress of not having enough to make ends meet is one they avoid. Other stresses, such as an interview for a new job, cannot be avoided, and so are best met head on, with preparation. 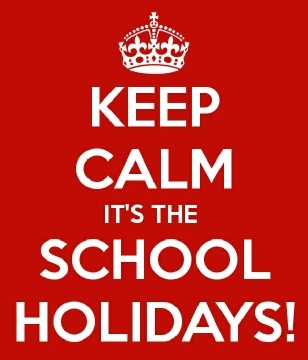 School holidays and times when the family is together more are no exception. Here, I would suggest that following a few basic principles can make the difference between a generally happy home and one where the stress can become distress. Just as adults need 'down time', children require time to relax and wind down from their busy school lives, to change gear from the Monday to Friday rush and to ease into the holidays. Activities are undoubtedly a fun and enjoyable part of any holiday period, yet learning to be a human being and not simply a human doing is invaluable. TV time, in moderation, is healthy and normal - give yourself permission to allow this! When the clouds break, the rain comes down and the trip to the park is definitely off, make sure you have something up your sleeve to fall back on. Planning for different eventualities is the psychological equivalent of not 'putting all your eggs in one basket'. Anxieties about how the holidays are going to run can be calmed by making sure you feel in control of events to some degree. If you ever get the opportunity to speak to a professional child minder, ask them about perhaps little known local attractions and events for children - after all, that is their line of work! Children often take their cue from the adults they are with, and so if you interpret some unplanned happening as a disaster, so will they. Their mood may be harder to recover even when you are over the shock of the unforeseen event, and so learning to laugh at the unexpected and shrug your shoulders philosophically may mean your children will follow your lead. So, the cinema showing ended at 2:30 p.m., not started? Laugh it off - it's an experience!